Holiday Inn Express Frederick-FSK Mall(I270/RT 85) Frederick, Hotel null. Limited Time Offer! 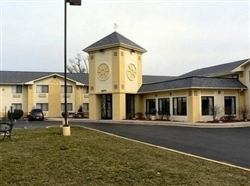 More of aRead more Business establishment, this two star hotel is located in Frederick. Several amenities, notably Room Service, Business Center, Laundry are available at the hotel.High speed internet is available in this hotel.This hotel offers a unique service : conference facilities.It is part of the hotel chain Holiday Inn Hotels & Resorts.Note:This hotel has a parking. Offering comfortable accommodation and convenient facilities, the Holiday Inn Frederick Holidome and Conference Center provides you with all of the quality amenities to make your stay a memorable one.